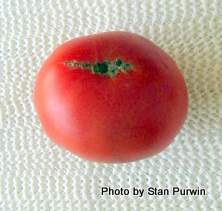 I posted last year about how Stan uses plant protectors to encourage early spring growth of his tomatoes—and how he usually picks his first big-red tomatoes around July 4. This year he picked his first big red 17 days before the Fourth. To read my earlier posting (May 31, 2011) showing Stan and his plant protectors, CLICK HERE. 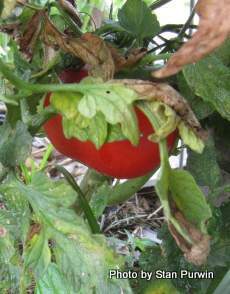 If want to see a tomato plant with “early blight” and to read additional information about the problem from the University of Maryland Extension’s Home and Garden Information Center, CLICK HERE. Sprinkle a handful of the mixture into each planting hole. For additional defense, sprinkle a little more powdered milk on top of the soil after planting and repeat every few weeks throughout the growing season. I tried this on some of my plants. In addition I've sprayed “Fung-onil” by Bonide and will be spraying liquid copper fungicide once a week. I'm also plucking any leaves that have any trace of early blight. I'm afraid this is just another example of Mr. Baker's hogwash. We all know, of course, that compost will improve the soil structure and provide some nutrients. But none of these materials alone or in combination will prevent or cure early blight infection. In fact, loading the root zone with excessive magnesium from epsom salts can decrease the availability of calcium and increase blossom-end rot problems.